Hope you all decide to follow me there! So, this has been really irking me since "coming out" with being pregnant, and I've been meaning to blog about it (because that's what we do when we have opinions, right?) When I got pregnant with Greyson, everyone was SO excited, yay it's your first baby, congratulations, etc. It was a really easy, uneventful pregnancy that was actually really fun to go through and experience all the changes and growth of this amazing little life. Now that we are pregnant again, I'm getting a lot of hesitancy from almost everyone. Like, "You are?" And little comments about finances have come up and it really ruins everything for a moment. I get a lot of skeptical looks from people and I don't have to be any Sookie Stackhouse to know that they're thinking I'm an idiot for having another baby. The only people I get genuine positive reactions from are other young moms (by the way I'm not even THAT young my mom-standards. I'll be 24 when #2 is born, ok? Just apparently everyone still thinks I'm straight out of high school still.) and of course from my own mom. I'm grateful for my friends and fellow struggling young parents - it's definitely not easy. But you know what, it is entirely worth every week that goes by wondering if the cable will be turned off. I mean if my biggest concern as a mostly-stay-at-home-mom is whether or not we can afford the luxury of 300 channels, then I have no room to complain, which means no one else has the right to judge my priorities. Yes, we struggle. But big flippin' deal. Show me someone who hasn't and I'll show you a liar. I'm excited about my new baby. I'm excited to see Greyson as a big brother and to have someone for him to play with. I'm excited to see Zack with all kinds of little kids hanging from his pant legs. I'm excited to have holiday traditions for these tiny souls and to show them how be respectful and considerate humans, while still being able to stand up for themselves. So there. I know the difficulties ahead of us, but I also know which things are important. And money isn't one of them. That being said, here's a little pregnancy update: I'm only 7 weeks, and I won't have my first doctor's appointment until after the new year, but everything is going smoothly. I'm not showing, but I have a definite curve in my lower abdomen that tells me things are growing! I wouldn't say I have morning sickness (though there was about a week there when I did have it) but now it's like I feel like I do the day after getting over the flu. Not quite right, but good enough. And cravings galore! Nothing in particular, it changes by the hour. And if I don't act on it, then I miss that window to eat something and I starve because I can't find anything that sounds good, so I force myself to eat a bagel or something. I never really have cravings with Greyson, but this one's got me all crazy. I can't go to the store very effectively anymore.... I come home with a deli sun sandwich, popcorn chicken, and all the ingredients for chocolate cake. So now I'm making sure I bring a list. Alright, I take back saying that this pregnancy is so far just like being pregnant with Greyson. A few days ago I started to feel crappy and it's gotten progressively worse, yet it's still not to the point where I have to actually throw up. Maybe I'm just actually getting sick? Greyson has a small cold but other than his nose running like a maniac, he seems fine. I just don't know. I'll be 6 weeks on Monday, so I guess if I actually am going to get morning sickness then now's about the time it'll show up, right? And all I seem to want is junk food followed. Like, ICEEs and brownies and Sour Patch Kids <I'm indulging in these right now. I'm pretty positive that I didn't want junk food with Greyson, I think I actually craved healthier stuff. And I'm blaming it on the hormones. I never really felt like this when I was pregnant with Greyson, but I'm just super irritable this time around (so far)! I feel sort of like I'm PMS'ing, but obviously I'm not. Luckily Zack is able to laugh it off, but I know that sooner or later I'm going to cause some feelers to get hurt. I just need to watch it. And watch it and watch it and watch it. Yep! 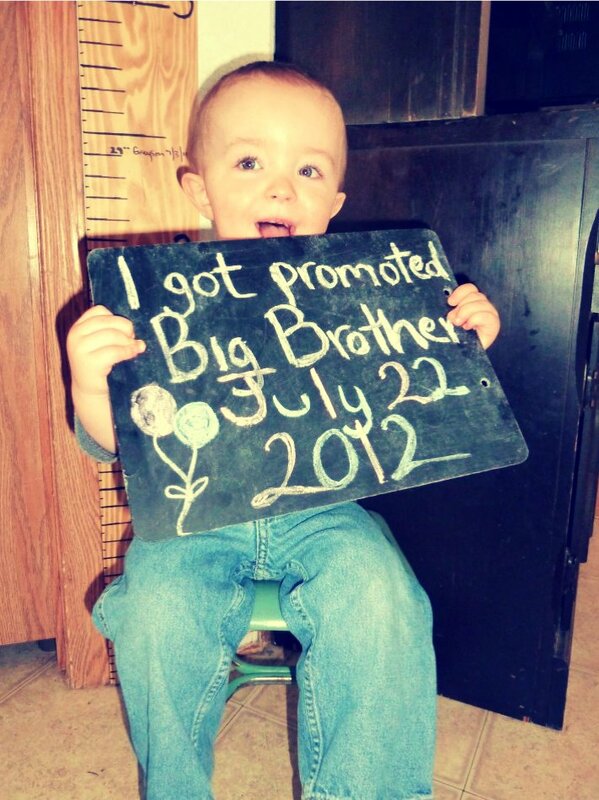 Greyson is due to be a big brother next July! We're very excited, even though we know it'll be hard. It's amazing how something that can be the biggest complication in your world can also be the greatest thing to happen to you, all at the same time! Baby #2 is due July 22nd, 2012 and Greyson will have just turned 2 years old. The big question on everyone's mind: Boy or Girl? Well we won't know until February or March (yes, we plan on finding out), but according to symptoms and old wives tales they all say Girl. BUT I remember saying Greyson was going to be a girl, but honestly I don't think I ever REALLY thought he'd be a girl. Whenever I thought about my impending baby it was always in the masculine form. But this one I can't help but think of it in the feminine. So we'll see how right or wrong I am in a few months. I'm only 5 weeks, so it's still too early for any possible morning sickness, though I never had a speck of it while pregnant with Greyson. I broke out a lot with him, but so far there's not a pimple to be seen which I'm incredibly thankful for. I already have to pee all the time, and I'm already hungry all the time. Only with this pregnancy all I seem to want is junk food, so I have to watch it. I know it's early to go public with this, let alone "Internet public" but everyone already know anyway because Zack and I can't keep our mouths shut. Plus, I feel very calm and patient with this one. With Greyson I couldn't wait for each doctor's appointment, each weekly milestone. And yes I'm excited for these things, but not nearly as anxious. I guess it's because I've been there and done that? Anyway, I hope to get back into blogging. I have a few more things to say, though these things need posts of their own. So all in good time. So if I don't get to blog again before Thanksgiving, have a wonderfully good stuffing filled thankful time! Some more mini pumpkins in a candle holders, and a blue pumpkin from the pumpkin patch! Possibly the best decoration - awesome sunset last night! Yesterday was only Day 1 of decorating, and I can decorate until Thanksgiving! So maybe I'll be posting more pictures. Maybe not though. When I was little, I had no formal Christian teachings, like, at all. Technically I was baptised a Lutheran, though now that I'm grown, I know it was to please my half-sister's (whom I love) grandparents (who I hardly know and don't really like.) But there was a short time in my life where we were actually going to The Light of the Valley Lutheran Church in Valley Center, CA along with my half-grandparents(?) and it was a novelty to me. Church was something people went to on TV. I specifically remember putting on my matching sunday dress and thinking I was going to see nuns (and I was excited about that), because all the churches on TV had nuns, therefore all churches in reality had nuns too. I just had no idea what church was, or why I was going. So when we were free of our obligation to go to church when my mom and my sister's dad split, we never ever went again. So I spent my childhood looking for something fun to believe in. Now I've come to the realization that I was actually yearning for some religion. I really do think it's important for children to have something to believe in. Whether it's Christianity, Buddhism, Islam, etc... I think it stems from children actually wanting and needing discipline in their behavior, only a belief and a religion is like a psychic discipline. We know (at least I did) that there is More out there. You have that innocent , untarnished trust that there has to be. So my very best childhood friend and I scoured her book of goddesses and chose our favorites. I always chose the prettiest, nicest, most whimsical one I could find and she always chose the strongest and wisest one. We ran around the avocado groves of Valley Center in costume pretending to be our favorites. Then I met Zack. We fell in love, we got married. We'd go to church with his dad and step-mom sometimes, and I'd go and enjoy the normalcy and the community of it. I'd hear the pastor's words and think "hey, isn't that wise! ", and go home and never remember what he said. I didn't feel it. I agreed that we need to be on our best behavior, but hey, I'm pretty much well-behaved all the time. No problem, I got this. Then we got pregnant and had Greyson last summer and isn't just like a baby to make you rethink your life? Suddenly I have this amazing awesome gift and not only am I blessed with this little boy, but I'm also responsible for him. Crap! What do I do?! We attempted to go to church again for the sake of our son, but we just weren't feeling it. I blamed it on not finding the "right" church. We just didn't click with these people. So we quit going once more. Then due to personal problems, we attempted church again and failed yet again. We since haven't gone back to church, but now I know why I haven't been able to "get it". It's because I didn't GET IT. I didn't actually believe in a God. I believed Jesus was a cool dude who lived once and who died a terrible death, but did I believe that God Almighty morphed himself into a baby to become a man and perform miracles and die in a crucial, appalling way to save us from our sins?? No. I didn't. Don't get me wrong. I wanted to believe it. But I always ended up shooting myself down. How could there even be a God?? How is it possible? You know what the kicker is? I never ever had a hard time believing in the devil or demons. I won't even watch possession movies or shows or read about demons for fear that my very thinking of them will invite them into my life. Weird how I readily believe in ultimate evil and not in ultimate Good. But there can't be an evil without Good, so that's more proof that there has to be ultimate Good. As I said in my first post, I picked up Mere Christianity from the library after a recommendation from a school friend off of Facebook, and I read it. And it clicked for me. I'm getting it. And even though my Christian Trail is short so far, my thinking and my actions have changed. I catch myself honestly praying throughout the day. I check myself when I start to cuss at some terrible driver on the road. I'm more understanding and patient with my husband. I wouldn't say I have a full sense of peace quite yet, but I'm gaining peace. So. That's it. I'm finding the More that I've wanted. My name is Christal and I've been married almost 4 years and have been a SAHM on and off for the last 1.5 years and I have a lot to learn. This is a place where I will share ideas I've had and ideas that are tried and true by others. From housekeeping to cooking to entertaining the kids, I'm on a journey to get by in the best way I can. Follow the Good Things via Email!